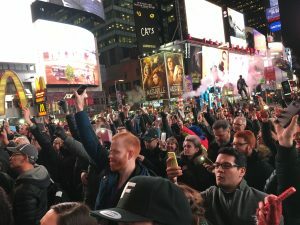 At 5:30pm on January 19, 2017 roughly 700 theaters in all 50 states participated in a ceremony pledging to “be a light for the dark, challenging times ahead.” The goal was to use the tradition of leaving a ghostlight on in dark theaters to renew theater’s commitment to being a space of inclusion and compassion for all people, regardless of race, class, religion, country of origin, immigration status, disability, age, gender identity, or sexual orientation. 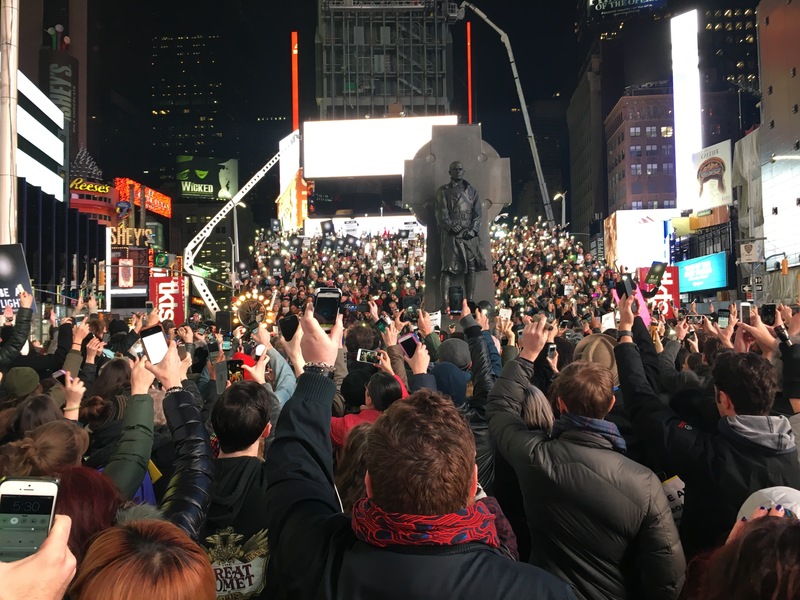 In New York City, there were five main “host” areas: Times Square at the red steps, The Public Theater, the National Black Theatre, BAM, and the Bushwick Starr. 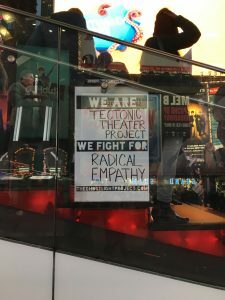 Many other theaters and groups like St. Ann’s, Atlantic, Columbia University, La Mama, Playwrights Horizons, and Signature participated in the ceremony as well. By 5:10pm, the crowd has about doubled. The steps are completely filled, and there are ten police officers milling about the plaza. People are mostly talking amongst themselves or observing quietly. A woman from Italy approaches. She asks if this is to protest Trump. I tell her yes. She tells me she teaches English Literature to teenagers in Rome. She wants to report back to them that there are in fact protests against Trump going on in the United States. 5:20pm. Cheers go up in the crowd. A few whoops of joy and shouts of “Ten more minutes!” A group of around 25 young tweens stand behind me observing the group on the steps and shouting out some of the phrases like “Be a light.” Their tone seems more mocking than sincere. People are invited to join everyone else on the steps, but there doesn’t seem to be any room. At 5:25pm, the woman on the loudspeaker says, “We are one community. 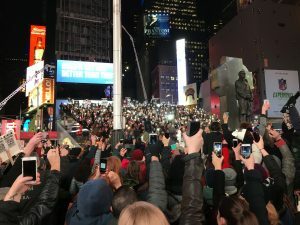 Say hello to everyone you don’t know.” The whole plaza between 47th and 46th street is full now. Lots of people are taking pictures and selfies. There at least several hundred people here. Later, I’ll hear reports that it’s 1,000 people. 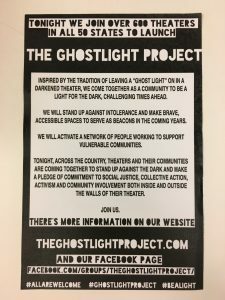 A microphone is passed around and people on the steps (I’m not close enough to see who exactly) explain what the Ghostlight project is and its reach (over 600 theaters in all 50 states). They explain the tradition of the Ghostlight and their commitment to welcoming and being accountable to all people. The people on the steps sing a song: “In the darkest night, we will be a light/we still stand here and be seen.” After a few verses, they recite the lyrics and ask the crowd to join them. By 5:37pm, the ceremony is over. The woman on the speaker tells people to “Be well. Be safe. And be a light.” People begin filing out.